It has been 49 days, 7 weeks, 1, 176 hours, or 70,560 minutes since we arrived at Moundou. And it has probably been the longest, most difficult 49 days of my life. Especially if you think of it in terms of minutes, then it sounds interminable. At the same time it is hard to believe that we have already been here for 7 weeks. It has flown by, probably because we have not had time to think about it. But tonight is the time to reflect on these 49 days, because today marked a turning point in our missionary experience. Bekki and I graduated from our Missionary Residency Training Program. The graduation was a little anticlimactic, we heard it rather than participated in it. And, I know what you are thinking, it had nothing to do with the Imam, although he was chatting on the microphone at about the same time. You see this morning at 5:47 am James and Sarah left. As in gone, as in all three French verbs (that I know), partir, sortir, and quitter. We heard them drive off, but didn’t get up since we had said our goodbyes last night. Tonight they are in N’djamena, and we are here. And you know what? By the grace of God, we are OK with it. There have been a lot of times the last few weeks, especially those first weeks, where I would have used the slightest excuse to go home. I even thought of which diseases would get me sent home. Unfortunately they were either not acceptable, or I was vaccinated against them. There were times I thought they would be sending me home in one of those white coats with the long wrap-around sleeves. There were times I thought I must be the worst missionary ever, and there have been a lot of times I really questioned the omniscience of God. I mean really, us? You couldn’t do any better? But now as I look back, I see once again how God has led us, and would not trade it for anything. James and Sarah held our hands as we took our first steps and then turned us loose at the right time, encouraging us, but letting us make mistakes and learn lessons the hard way, through experience. And through the darkest days, when we thought we were drowning, and couldn’t see the surface of the water, because of your prayers and encouragement, God sustained us. We are making friends with the staff members, and with the church members. In fact each Sabbath morning we load up the ambulance and take up to 15 or more people to church with us from the area around the hospital. After church yesterday, Bekki was invited to a women’s council meeting where they planned the upcoming events for women’s week. I met the Principal of the local Adventist School and he took me and several others over to the school to look it over. Partially of course, to start hitting me up for money to help build it up. But you know, I can’t blame him. Four hundred students in primary school (six grades) with seven teachers, in one and a half buildings. The half building is missing it’s top half and roof, except for two rooms which have a thatch roof. They have lots of land, just not much in the way of buildings, so I would be looking for funding too. We are also starting to get the crazy work schedule under control. Tomorrow night the administrative committee meets for the first time with me as medical director. We will be discussing the answer to the question: “What is the mission of the Surgical Center of Moundou?” We have to decide that before we can move on to the other questions and issues. The surgery center is at a crossroads, it has been functioning somewhere between a general hospital and a surgery center with most of the problems of both without the benefits. We really need an identity. Tonight we are in the big house. It is as good as anticipated. Even though we don’t have most of our things, and we are still sleeping on a mattress on the floor, it is still a huge leap forward. James and Sarah were gracious hosts, but we were still guests in their home. Now we are in our home, we are at our hospital, with our volunteers, with our staff. For tonight all is well, we are at peace, we are content, we are happy. Even though I know many more difficulties lie ahead, we finished our training with our heads held high, ready to start the next exciting phase of our missionary career. For we know in Whom we have believed, and we know we have you behind us, giving us love, support and prayers from all over the world. 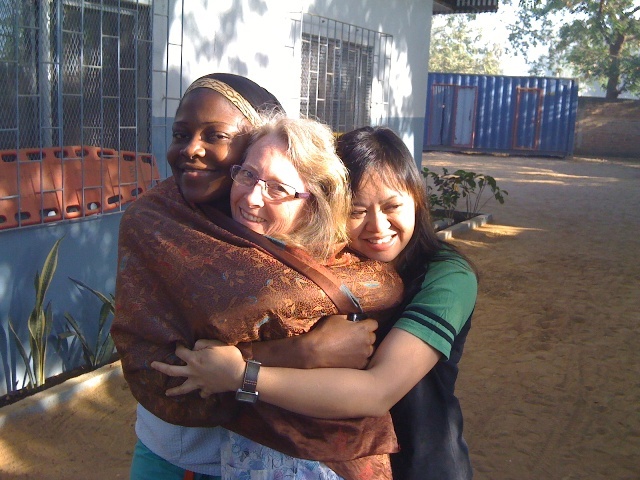 Bekki wrapped up with Severine, one of our nurses, and Ly-dianna, one of our volunteers. It is cold in the morning, probably 70. For those of you new to our blog please look around at the other pages, the “About” page tells a bit of who we are and our background, the “Definitions” page explains some terms that are used that some of you may not be familiar with, such as GC or AHI. The “Timeline” gives an idea of where we will be throughout the year, and the “Video” page has a video Bekki made of Koza Hospital, where we initially were to be. Soon there will be a new video about Moundou. There is also the Surgical Pictures Page, but be forewarned, it has some very graphic pictures, so if you don’t like blood and guts, stay away from that page. You will also find links to other missionary blogs such as Olen and Danae Netteburg, Jaime and Tammy Parker and others. Finally, if you like our blog and want to receive each new post directly to your e-mail, please sign up with your e-mail in the subscribe box. It doesn’t cost anything, there is no commitment, it just makes it easier to follow us. This is Bekki. I’ve been awake since 3:30a.m. Maybe I need to be praying for someone, or maybe me. I hate to burden you again but your prayers have sent supernatural help so many times and I feel we need it again. We found out last night that the Dr. We are replacing is leaving permanently on Sunday. The paperwork that was supposed to be done to allow us to stay has not been finished and now is running into governmental red tape soooo bottom line is we may be sent to Batouri, Cameroon. I really just want to settle and start attaching to someplace. If we are staying I will start working on getting chairs for the patients to sit in and getting a concrete pad for physical therapy etc, etc, etc. but if we are moving I would rather save my limited resources for the needs at Batouri. Our shipping container which was supposed to arrive in port 3 wks ago still hasn’t, but since it doesn’t have a destination that is just as well. However the Appels are moving on Sunday with their things including most pots and pans and dishes. They are leaving a few things but it will be difficult around here. So do I go buy dishes, furniture, pots and pans that I won’t need when my container arrives and can’t take with me if we go to Cameroon? Oh and I leave for the US in 2 wks and Scott won’t be able to wade through the container and unpack until I get back the end of April. So 2 months more of camping for him. 1. Water leak source gets found fixed and isn’t expensive. 2. Supernatural help while we fly solo. 3. A permanent assignment. Paper work gets resolved or we get reassigned and that someone from our churches West Africa Division will communicate with us. 4. Our shipping container gets delivered to our permanent assignment in the next few weeks. 5 OUR HOUSE WILL SELL! Enough whining, really God is good and we see miracles every day. Maybe I am awake because YOU need supernatural help in your life today and I need to be praying for you. So while you are sleeping I will be praying for you and while I am sleeping thanks for praying for us. P.s. 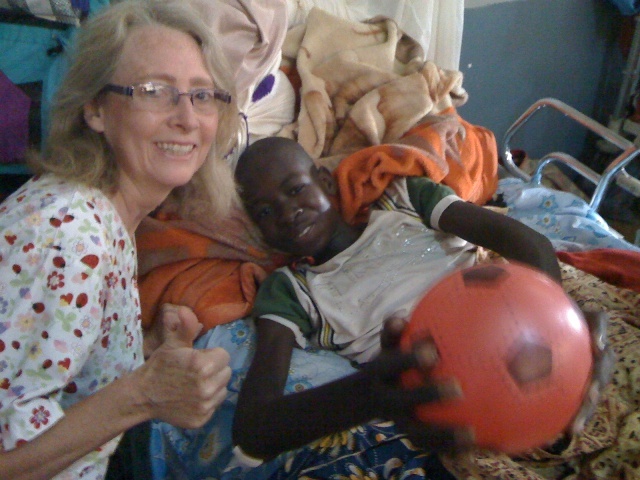 Scott did have malaria but is better now. He was only down one day. It is almost 7:30 Monday evening and I am in bed, hoping against hope that the utter fatigue and back ache and almost nausea and lack of appetite is just exhaustion and dehydration and not malaria. I will know more in the next few hours. But so far no fever and I feel better after my shower. But that is not what I wanted to write about tonight. If you have ever doubted the power of your intercessory prayers let me tell you about the last few days. Last week was pretty tough. It was crazy busy, running from fire to fire all day and well into the evening. Really sick people with difficult surgeries and lots more “firsts”, so by Friday afternoon at 5 when I finally left the hospital for home I was totally wasted. I was also starting to get cranky. My nurses in the US who have been through this with me before will know what I am talking about. Friday night I unloaded on Bekki, I was really frustrated because I knew I could not keep up this pace, and I did not see any end to it, nor could I see a way to control it. I also was feeling resentment that everyone else has regular work hours, but I am expected to work 10-12 hours six days a week and then be available the rest of the time for emergencies or questions. You know the usual doctor thing. I also was having a hard time seeing how I was really helping anyone. And the whole scenario did not match my picture of being a missionary doctor. 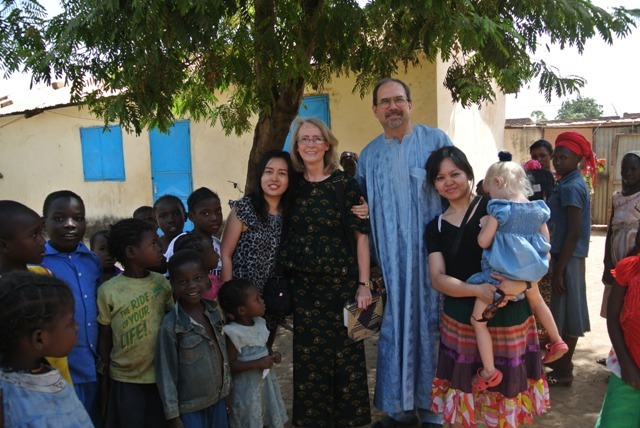 After Church in Moundou with our two Malaysian nurse volunteers. As Bekki and I talked through the weekend we started to come up with ways to control the situation and make it more manageable. One of the premier ways was to stop doing OB. I don’t know much about OB, most of the nurses here don’t seem to know much about it, and there are two obstetricians at the government hospital less than a kilometer away. And if they don’t do OB better there than we do here, Tchad is in a lot of trouble. So my first resolution was, “No more OB”. Saturday night the nurse came to the door just at bedtime, “Docteur, there is a lady who needs a Cesarean section.” So off I went to find out why. Turns out she is just starting labor and had two previous c-sections, so he was right, she needed a c-section. Now I have not done very many c-sections and doing a repeat one in the middle of the night with a limited crew and nurses who don’t seem to know much about baby resuscitation was not my idea of a fun Saturday night. So I told Appo (the nurse) to send her over to the government hospital, I was done doing OB. Since he is one of the nurses who doesn’t know much OB either, he was very happy to comply. I was then hit with a huge case of the guilts. Was I just lazy? Was I wimping out? Was I failing in my missionary duty? The guilt just made me mad. It was now 11 pm, I had a long day ahead of me on Sunday and I knew that I would not sleep well since I was so upset, so I did a very bad thing. I took a sleeping pill. Slept great, all night, and as far as I remember no nurses came to get me. Until Sunday morning at 6, Appo was back. “Docteur, there is another woman in labor, should I send her to the government hospital as well?” Appo is one of my favorite nurses, now he is in the running for nurse of the year. But of course the guilt came back as well. Off to work. Sunday is a regular day here, but it was a zoo. We never got around to worship because everyone was trying to resuscitate a baby with malaria, respiratory problems and a hemoglobin of 3. Not a typo, we see that all the time here. And Dr. Rollin Bland was coming from Bere to help with a couple of tough ortho cases. I was in a foul mood to put it bluntly. Before rounds I talked with our head nurse about stopping OB. I told him I had no training in it, and kindly told him most of his nurses didn’t know what they are doing either. He countered that one nurse is a mid-wife and perhaps she could do the OB . Not the response I wanted. He was not getting the picture, even with a midwife she is going to call me for the difficult deliveries. Yea right, I don’t know how to do the normal ones, let alone the difficult ones. Honestly people, we are doctors, not omniscient, ommipotent gods. Then we only got through half of rounds, which is always tough because I promise to come back and finish, but rarely have the time to do it. So I hope that everyone is OK, but honestly they are on their own. When Rollin got here, I was the good little missionary doctor on the outside and a seething bad missionary doctor on the inside. Then we did the first case. This is where I am supposed to tell you how God intervened and it was a great case and all went well and we saved the patient from untold future agony and on top of it he gave his heart to Jesus just before going under. Nope, not happening. It was a miserable case, complex proximal tibia fracture, with several fracture lines into the joint and a spiral fracture down the shaft of the tibia. By the time we finished we both were questioning if we had done this guy any favors. an incarcerated hernia to do, plus the consults and ultrasounds piling up on my desk. I finished by 7:00 pm and went over to the house. The volunteers had spent the afternoon cooking, so we had pizza and homemade fresh peanut butter cookies. They were a taste of heaven. But what was strange was that somewhere during that busy day, my bitterness, my frustration, my anger had disappeared. I was at peace. And today, I had a great time. I worked hard, did a difficult 2 month old tibia fracture (fractures in 2 places) and had a typical run run day and was achy and tired all day as well. But I enjoyed it. I felt like I was making a difference. Which when you are here is critical. I felt like I helped these people, and although no one prayed the sinners prayer with me (I had to because of my cranky weekend), I felt like I touched people with the love of Jesus. So what happened? Last night when I was looking over e-mails and facebook I saw e-mails from Archie and Dee Willis and Doris and Bob Bivens saying that they had prayed for us special because Bekki had sent out a request for special prayer for us. I cannot believe how dramatic the answer to that prayer was. It affected both of us deeply and changed our attitudes. Bekki spent four hours last week tediously separating rocks out of the wheat berries. Yesterday she washed them and put them on a rack to dry in the sun. She came back later to find the rack tipped over and all the wheat berries in the dirt, ruined. (Either the dog or the chickens are guilty, no one has claimed responsibility yet, although we did tell them that one chicken a day was going to market until someone owned up.) Normally that would have brought tears and anger, but she shrugged it off to life in the mission field. That my friends is the power of prayer. Many of you have written on facebook or commented on the blog that you are praying for us. Please don’t stop. It really makes a difference, not only for us but for those we serve. Really, if you could be here and see what it is really like, you would understand when I say that every operation that is successful, every patient that goes home feeling better, is a miracle, as real as any performed by Elijah or Moses. It is the power of your prayers and ours. For those of you new to our blog please look around at the other pages, the “About” page tells a bit of who we are and our background, the “Definitions” page explains some terms that are used that some of you may not be familiar with, such as GC or AHI. The “Timeline” gives an idea of where we will be throughout the year, and the “Video” page has a video Bekki made of Koza Hospital, where we initially were to be. Soon there will be a new video about Moundou. We recently added a page of OR pictures, but I must warn you, it is not for the faint of heart or squeamish. You will also find links to other missionary blogs such as Olen and Danae Netteburg, Jaime and Tammy Parker and others. Finally, if you like our blog and want to receive each new post directly to your e-mail, please sign up with your e-mail in the subscribe box. It doesn’t cost anything, there is no commitment, it just makes it easier to follow us. If you peruse most of the West African Missionary blogs you will find something about volunteers. Olen and Danae Netteburg are probably the most blatant, “Volunteers Welcome” is what it says. We probably should be that blatant as well because I have come to realize that our little hospital in Moundou would be in big trouble without our volunteer staff. By the way that “Surgical Center of Moundou” stuff is nonsense, we are a little hospital with a 24/7 ER, and Pediatrics, Maternity, Internal Medicine, Oncology, Orthopedics, General Surgery, Urology, ENT, Neurosurgery, Thoracic Surgery and Plastic Surgery departments, a Physical Therapy and Occupational Therapy department, Radiology department (Ultrasound), Outpatient Services, Central supply, and our own Skilled Nursing Facility for long term Rehab. And if you don’t believe me, since I have been here we have done a craniotomy for an epidural hematoma, goiter surgery, prostatectomies, kidney resections, intramedullary nails for long bone fractures, ORIF’s, Chest tubes, muscle transposition grafts, laparotomies for trauma, perforated ulcers and acute gangrenous cholecystitis,C sections, hysterectomies, we have treated hypertension, diabetes, infectious diseases, done ultrasound guided needle drainage of liver abscesses, OB and diagnostic ultrasounds, and that was all just yesterday. Ha ha, just kidding, although yesterday seemed like we did all that. Bekki of course runs the Physical and OT department (we are small enough to combine the two departments), but who runs the outpatient services, and all the other departments. Some of them are cared for by our Tchadian nursing staff, who I have been impressed with. However, without our volunteers we would be in a world of hurt. Let me explain. Right now we are blessed to have five volunteers, although two are leaving tomorrow. We have two Danish nurses, one (Rebecca) who came in December and will be here until June. She is in charge of our outpatient program and also coordinates the volunteer staff. She also is in charge of central supply, organization, collation and inventory. The other Danish nurse (Laura) is here for a couple of months, and we have had two Malaysian nurses for the last 10 days. To round out the volunteer staff we have Johnny Ahn a senior college student from the US who will be with us until July. So exactly what do the volunteers do? What could you do if you wanted to come visit us and volunteer for a short or a longer term. Well, those who are medically trained are immediately put to work in nursing or doctoring, longer term volunteers will probably be put in charge of a department. And those with no medical experience end up being everyone else’s right hand person, which means whoever needs help most urgently, gets those volunteers. Allow me to give you some real life examples. Our circulator in the OR is pregnant and has not been feeling well, plus her kids had malaria and she had a snake in the house, you know all the usual stuff people have to deal with. So she has not been available a lot of the last two weeks. Our Malaysian nurses jumped in, quickly learned where things are, how to turn on the suction and where the gloves and suture are and generally worked in the OR. Everyone has helped Bekki ambulate and exercise patients, Bekki and Johnny have taken down the curtains in the hospital and washed them and rinsed them in permethrin. Rebecca (the other Rebecca, our long term Danish nurse) has been teaching everyone to do dressing changes so they can help with the outpatient department. Everyone has also been involved in cleaning, organizing and sorting the container that is full of medical supplies, so we have some idea of what is available. But where our volunteers really make a difference is at crunch time. They bring an energy that sometimes those of that live here lack. When we have after hours surgeries it is the volunteers who come in and give the extra hands and help that is so desperately needed. Last night we did a really difficult necrotic gall bladder, Johnny scrubbed in as second assist. I truthfully told him that he could write his parents that he had helped save a life because we truly could not have done it without him. When we have a patient crashing it is our volunteer nurses who are there lending the desperately needed hands, prayers and encouragement. And as much as I am learning to love my Tchadian nurses it is so nice to have western volunteers to talk to when the day is done. It is a taste of home, no matter what part of the west they come from. So what can you do? You can fold compresses (gauze sponges for surgery, we make our own), clean, wash walls, paint, cook, ambulate people, learn and do physical therapy, change dressings, be a runner, assist in surgery, learn how to clean and sterilize instruments, pull teeth, do tiling or making and installing cabinets, fix bio medical equipment, show the Jesus video in the evenings, learn some tropical medicine, chase down and kill the blasted flies in the OR…the list is limited only by the imagination. What can’t you do here? Don’t expect to lay out in the sun all day drinking Mai Tai’s (virgin of course), don’t expect to not get a broken heart, don’t expect to leave with all your clothes, in fact don’t expect to leave with a full suitcase, don’t expect this to be a vacation, above all don’t expect to leave here the same as when you came. If this has touched a chord in your heart, if you feel the Holy Spirit calling you to mission service, even for a short term of two weeks, this is what you need to do. First say, “Yes Lord, here I am Lord”, then let me know. We can help you find the place that is right for you, if it is not Moundou. We can also help get you started on the process for becoming a short term missionary, and tell you how to make it affordable (by the way, I have yet to see a time when money has been an object in the way for someone called by God). So come on over, it is only 30 hours from the US to Tchad, and with the modern legal medications available the time can go by pretty fast. We will keep the light on for you. This is Bekki writing so it won’t be as interesting, but Scott is operating, I am bored and so wanting to reach out and talk to all of you. So here it goes. I am not sure Tchad has ever seen a flake of snow but here in Moundou today we have had Olympic worthy events. Scott is just now removing his first gall bladder in Africa. And for our medical friends, under ketamine, diazepam, maybe some local lidocaine, a low spinal, and a whole lot of Grace! It was a huge necrotic full of bile gallbladder. He will feel better tomorrow-and he will walk! I.V. And all. The nurses cannot get over the crazy American idea of people walking with an I.V. Not sure why they think there are wheels on I.V. poles. Rozi, an older man that has a very dignified way about him got out of bed for the first time in 6 wks at least. He had been in traction for a broken hip-long story. He was told he couldn’t go home until he walked with his crutches. He still can’t put any wt on that leg for another 6 wks. He is so motivated to go home. He misses home. He is going home tomorrow and I will miss him! Franklin, the boy in our last blog, walked with a walker today mostly under his own power! There is not one single step of progress I have not had to fight with him and his Mom over. They are both convinced he “can’t” and are always totally shocked and overjoyed when they see that he “can”! The other patients, their families and visitors have seen how hard we have worked together and were literally coming out of all the other buildings and from all over the compound to see Franklin walk and cheer him on! It was our Olympics. And my kids will not be surprised to hear that I cried. He also broke his rt arm just above the elbow and it is now very stiff. Today he bent it far enough to get his fingers in his mouth. That is huge! People eat with their rt hand here. He can feed himself! Another lady with a below the knee amputation walked on crutches for the first time. We always have an argument about getting out of bed and walking. I am the steady annoying drip that you finally move just to get away from. I always win and she always tries to stay in bed. Tomorrow I hope we can discharge her and refer her to a Catholic Handicap Center here that has physical therapists and 9 full time prosthesis makers. They make jointed ones as good as in the US. I just heard the generator shut off so they must be done in the OR. Scott will be home soon, ready for a cold shower- it is regularly over 100 degrees now, and ready to call it another day Under the African Son. May God bless and keep you all dear friends. 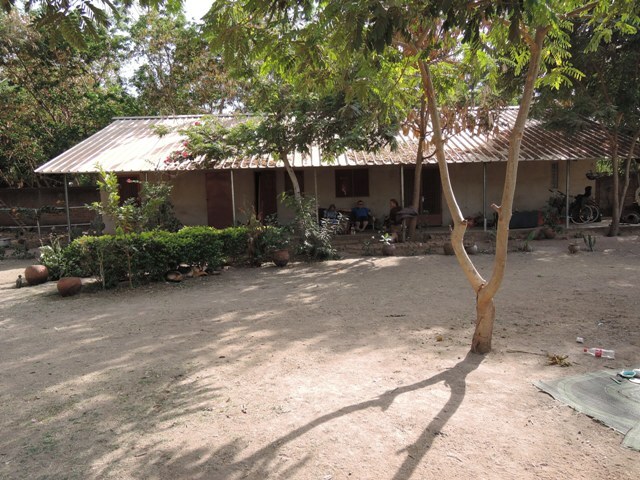 It has now been 5 weeks since we arrived in Tchad. Reality has set in. A little voice has been telling me several times a day as I work in the hospital or am in the residence compound, “This is your life now.” We aren’t going home anytime soon to climate controlled, clean work environments, hot showers, reliable electricity, minimal body odor, a mono-linguistic society, or for that matter a society we understand and know how to navigate in. Nope we are here to stay. This is home now. I have to be honest, I am not sure how I feel about that. That short term mission trip thing is looking pretty good about now. I wish there was some way I could convey to you what life is like here, in one of the least of the world’s countries. Where dirt is normal and everywhere. I was looking at one of our tubes of KY jelly today, it is filthy (they all are), the cap is broken, it looks like something I would have in my shop, not in a hospital. I am getting so used to the flies being around when I operate that soon I am going to be asking for them if I don’t see them. Flimsy, poorly fitting metal doors with funny locks and lousy finish work are the standard, when there are doors. Normal is doing ultrasounds while a woman 4 feet away is in labor. Where normal is making rounds partly to find out which patients died in the last 24 hours. Normal is little 8 month old babies who are going to die, who weigh 6 kilograms (13 pounds), on a good day, they have a hemoglobin of 3 or 4, you can count all their ribs to make sure they have the correct number, and they are too listless to even look at you or cry when you examine them (which is pointless anyway since they are already getting all the treatment we have and we don’t have many diagnostic tests to begin with). Normal is the dueling Imams from the two closest mosques between 4:30 and 5:30 each morning. Normal is being on a 1 acre compound for days or weeks at a time and being happy that you don’t have to leave, because there is no place to go. Normal is our version of a skilled nursing facility, a 15 foot wide space between the two wards with a roof over it and a concrete floor. When you are here only for dressing changes on your horrific wound, and you live too far away to come back daily we move you out to the SNF (my nurses call it that now, I taught them) where you can lay on the concrete floor on a mat all day and night. Normal is a government dispensary 50 to a 100 km (depending on which direction you go) from the nearest pharmacy. They can do a rapid malaria test, but have zero, no, none, supplies or medications. So the nurse can tell you that you have malaria, but cannot give you any meds, he can help deliver your baby but there is no gauze, no suture, no nothing. It is a fairly nice building by Tchadian standards, but it is empty, a whited sepulcher, a promise of something that is not there. So if that is our new normal why are we here? That is a question we have asked ourselves close to a million times the last five weeks. Why haven’t we snuck out of here with our tails between our legs like we wanted to so many times. I can finally tell you why, it is because of what happened between the time I started this blog and now. I was almost done with the paragraph on normality (yes the whiney one), when Carlos (finally a nurse with a name I can pronounce) came to the door and said the man with the 4 month old femur fracture was back with his x-rays. Great, I wanted to get him scheduled for Sunday when Dr. Rollin Bland is coming down so we can do two Sign Nail procedures together. I went over the hospital and got him set up for surgery, (history and physicals here are great, “femur fracture for 4 months, left leg 3 cm shorter than right leg, IM nail left femur”, no really that is it), I saw another patient with a lipoma, set him up for surgery and then Bekki found me. She was all smiles, I have not seen her that happy since we got here. She had a bucket with a ball and some rubber straps in it. “You have got to come see this”, she told me. So off we went to the men’s ward and she showed me how she used the ball to get this teenager with a broken arm and leg to move his painfully broken limbs. The whole ward was cheering them on. When we got here no one was doing any physical therapy with these orthopedic patients, no one had the time. Bekki picked it up and she has changed the place. Patients and families work together, encouraging each other, cheering each other on. And when one mother tried to protect her son from the mean PT (Bekki) the other families told her to back off and let Bekki do her job. Before she came no one went outside, no one walked, no one moved. Now they walk with their crutches, but they walk, they get outside, they move. She has made a huge difference already. While we were doing that Carlos (the nurse) came over with an Arab man who had an x-ray. 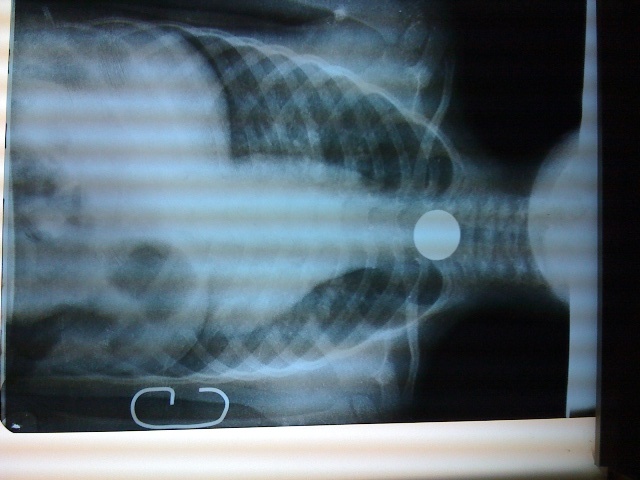 His four year old had done the world wide, time honored activity of swallowing a coin. I can’t tell you how many times I have seen that same x-ray in my years of practice. It had happened 9 hours before and he was at the government hospital and they were apparently not going to do anything. So I said bring him on over. After supper we got things set up. There are two Danish nurses here volunteering for a few months, and two Malaysian nurses visiting for 10 days and Bekki and I, plus our Tchadian OR nurse, Abel. Many hands make light work, or else it is misery loves company. There were a lot of prayers as we prepared to try to get the coin out of his esophagus. We do not have paralytics, only diazepam and ketamine, and I wanted it to be as simple as possible without having to intubate him. Did I mention all the prayers? By the grace of God we got both coins out (yes two coins) and with a living breathing four year old. God is so good. Mom had not wanted this to happen, Dad understood the seriousness of leaving the coins in there. Dad was so pleased he gave a 10,000 CFA ($20) donation to the staff and said that he would tell all his friends and they would come here now for their care. As if I am not busy enough, oh well. We were also able to give God the very deserved glory, because truly anything good that happens here is by the grace of God. Little Mahamet, with the coins where they belong, on the outside. 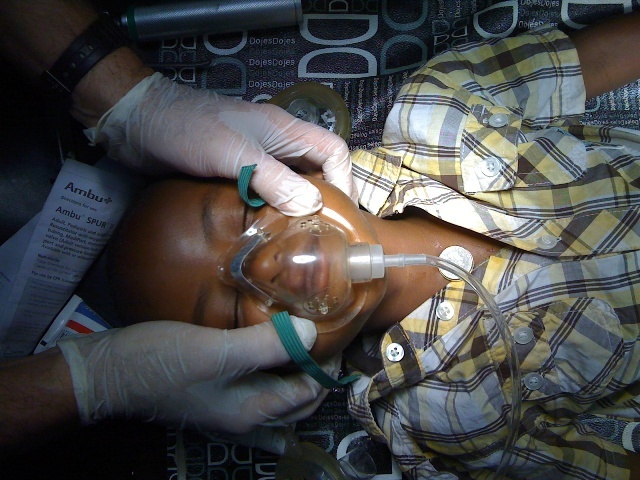 If we had not been here that little boy would likely have eroded his esophagus, in addition to not being able to eat or drink, he would have died. Normal here is really bizarre and strange, but for the first time in five weeks I know why we are here. And even though there is so much that is new to us and we have so much to learn, and we will continue to make mistakes, it is really hard to make things worse here than they already are. When someone is going to die or be severely disabled, anything you try is better than nothing. That is a lesson we are still learning. The other lesson is that God truly does work miracles out here. Actually He probably works miracles where you are as well, it is just harder to see them.